So we had a little flurry of retirements at work - two in January, and now another one the end of this week. This time I asked my co-worker what colors she wanted. She came back and asked if I could do a Hawaiian quilt. Um - yeah - not me. I don't applique very much at all - and this definitely was not time for me to challenge myself with something on that scale. So I compromised - I found this Triple Bear Paw two color quilt pattern online from Martingale Press - and chose two hibiscus and swirl fabrics in the colors that my coworker suggeseted - and "HIbernation" was born (or HI-bear-nation -to be more accurate). 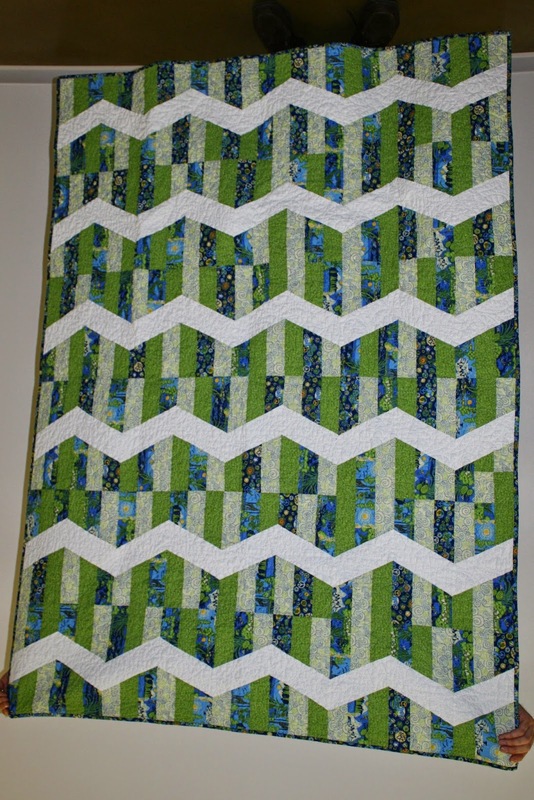 I wish I was more confident with softer rounder quilting -but I did a lot of echo quilting (and pivoting) on this one. If I had it all to do over, I would have quilted it in a round spiral from the center. It is nice to be outside photographing again - the spring flowers are starting to pop, and everything is greening up. After this photo session, I spent the rest of the day transplanting and pruning shrubs, weeding, and giving the rosebush a much needed "haircut." My coworkers didn't time their retirements too well for this quilter - I ended up with two only 7 days apart. This one was made with a 'faux' jelly roll - it only had 4 different fabrics but I still think it worked to give this quilt some movement and interest. I used my Lazy Angle ruler and this is my own layout (after an oops) - or my "Lazy Streak" (though for this gift I called it "See the World" - either name would work for a new retiree, don't you think?" Unfortunately the weather was not so cooperative this day -so this is the only photo I was able to get. I was able to set aside enough of the strips from the "roll" to use for the binding. This is my 2nd finish for 2015 - a retirement quilt for a very dear coworker and mentor. She said she liked peaches and corals, and when I saw this kit from Connecting Threads, I knew I was on the right track. I backed it in orange, and bound it in brown, since those are the school colors for the university we work at. After a deep clean of my craft room and some "chaos recovery" from pre-holiday sewing and wrapping and craft shows, I started in on some new projects. I had 11 days off, and a few were spent cooking, taking down Christmas, tending to a sick child, and running errands - but I still managed to complete one 60" square quilt start to finish - all but the final washing! I also started and assembled one top - creating a new layout once I oopsed on following the pattern. (tutorial may follow - it was using a specialty ruler and I want to check with the ruler designer first so I don't step on any toes). That one was speedy as I used a "jelly roll" so it minimized the cutting needed. The best part - both were made with fabrics I had on hand! Pictures of both to follow when I get some better lighting - it was pretty dreary today and the house seemed too dark for photos. Maybe it was that all the Christmas lights were down. It is a good start to the year (all but the sick child part). I don't know that I have blogged enough in 2014 to do a "year end recap" though it has been a productive year. Planned projects were finished (mostly), unplanned projects were finished, and even a few UFO's were ... well... moved further along in the process. I even did two craft shows! 2015 starts another trip around the sun. I wonder what lies in store for the year ahead. More frequent blogging, perhaps? This is a post I didn't really want to write about - but I want to document this quilt, and tell a bit about the very special person I made it for. Bruce Greene was THE art teacher in my school. His wife Susan taught elementary school art, and Bruce taught Junior High and High School. We are talking small school here - graduating classes of approx 55, and K-12 all in one interconnected building.... often riding the same school busses to and from school. Everyone had the Greenes as teachers - even if you didn't study art in High School (like I didn't), you at least had 2 years with Mr. Greene in Junior High. And he was good! He was one of those teachers that left a strong impression in his students. Unfortunately - I learned about a month ago that Mr. Greene was very ill and not expected to live much longer. 3 months, I was told. My immediate response? Make a quilt. My next thought? Make a quilt and ask my siblings to contribute their own thoughts and blocks to it. Then I got this crazy idea to jump on Facebook and ask all my classmates, my school mates, Mr. Greene's former colleagues, friends - anyone who wanted. Send me your blocks. Send me your names. Send me whatever you want - and I will be sure it gets into this quilt. Just send it FAST!!! And they responded. The depth of emotion, the creativity, the trust they put in me to put together their words into a tribute to a beloved teacher... it was a surreal couple of weeks as I put this together. I mailed it out on Monday, June 23rd and it arrived on the 24th. 12 days later I received the news that Mr. Greene had died. But he spent some time wrapped in our "Collage of the heART" - wrapped in gratitude, admiration, and love. Thank you, Bruce and Susan Greene - you planted the seeds of my art, gave me roots - and then gave me wings to fly.